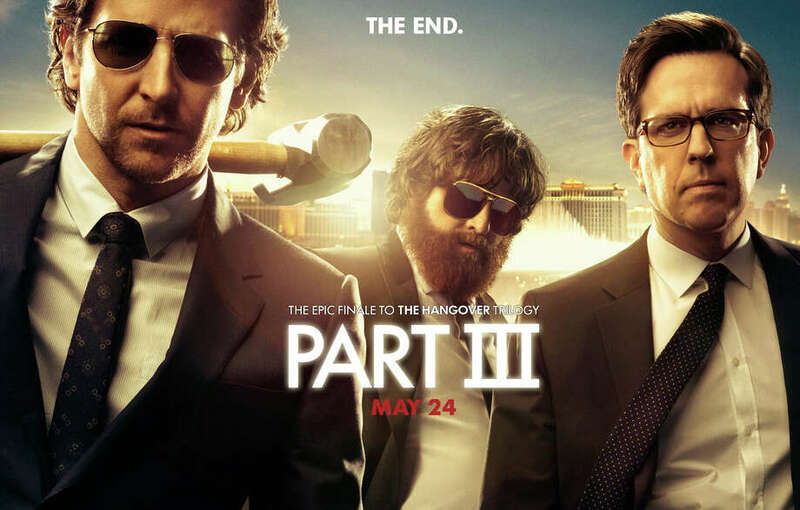 "The Hangover, Part III" is now playing in area movie theaters. Back in 2007, screenwriters Jon Lucas and Scott Moore pitched director Todd Phillips "What Happens in Vegas," a raunchy comedy about a bizarre bachelor party in which the groom went missing. Re-titled "The Hangover," it starred Bradley Cooper, Ed Helms and Zach Galifianakis, costing about $35 million to make. After grossing $467.5 million worldwide, a sequel was inevitable, and that raked in a record-shattering $586.8 million. Undoubtedly, this third -- and final -- installment will be highly profitable, too. Problem is: It's not a caper, not a comedy. Nobody wakes up, having forgotten what happened. Instead, spoiled, self-centered Alan (Galifianakis) has discarded his meds. After he's in a fatal freeway accident involving the graphic decapitation of a giraffe, his doting dad (Jeffrey Tambor) dies of a heart attack. Alan's close friends -- stalwart dentist Stu (Helms) and ladies' man Phil (Cooper) -- are determined to get him into an Arizona psychiatric/rehab facility. En route, they're ambushed. Alan's brother, Doug (Justin Bartha), is kidnapped by Marshall (John Goodman), a menacing mobster and his gang, including Black Doug (Mike Epps), who holds the Wolfpack responsible for $20-plus million in gold ingots stolen by Mr. Chow (Ken Jeong), the obnoxious, trash-talking Asian gangster who has just escaped from a Thai prison. So hapless Doug is held hostage until Leslie Chow can be brought to justice. After trekking to Tijuana, Mexico, they wind up back in Vegas, where they run into stripper mom Jade (Heather Graham) with her young son, and Alan falls in love with a surly pawn shop clerk (Melissa McCarthy, doing a cameo). Screenwriter/director Todd Phillips and co-scripter Craig Mazin cynically juggle the genres in a rehash of gross, stale material that's no longer amusing, not even the smoking monkey. The moronic plot basically revolves around clueless man-child Alan and stereotypically mean-spirited Mr. Chow. As Alan says, "When we get together, bad things happen and people get hurt." On the Granger Movie Gauge of 1 to 10, "The Hangover, Part III" is a tepid 3, followed by a reminiscent, post-credit epilogue. Years ago, coming-of-age films revolved around confused adolescents/teenagers. Now the demographic has expanded: entitled twentysomethings are still floundering, trying to find themselves. Writing the script with his leading lady, Greta Gerwig, director Noah Baumbach ("The Squid and the Whale," "Margot at the Wedding") has fashioned an arrested development serio-comedy about a well-educated, yet socially awkward 27-year-old New Yorker named Frances, who enjoys telling people that she and her inseparable Vassar college roommate/best friend Sophie (Mickey Sumner) "are the same person with different hair." But they're not. Self-absorbed Sophie has a good job in publishing, while disarmingly delusional, self-deprecating Frances is a klutzy apprentice at an artsy modern-dance company. And while Frances wouldn't even consider leaving Brooklyn -- and Sophie -- to move in with her boyfriend, Sophie has no hesitation about ditching Frances for a swankier move to TriBeCa. Sophie's departure leaves Frances floating from apartment to apartment. Title cards list her various addresses. "I'm so embarrassed," she admits. "I'm not a real person yet." Filmed by cinematographer Sam Levy in black and white, like the French New Wave, with an obviously miniscule budget, it's a facile, off-beat, female friendship story that's adorned with excerpts from musical scores by Georges Delerue, who often collaborated with Francois Truffaut, along with vintage David Bowie and other rock/pop tunes. Quirky, beguiling Gerwig, who worked with Baumbach previously in Ben Stiller's "Greenberg" and became his off-screen girlfriend, also emoted in Woody Allen's "To Rome With Love" and Whit Stillman's "Damsels in Distress." Here, Gerwig's Sacramento-based parents are played by her real-life mother and father. British actress Sumner is the daughter of Sting and Trudy Styler. And seeing Adam Driver from TV's "Girls" as a womanizing artist, reinforces the similarity with Lena Dunham's hit HBO series. Why the title? Peripatetic Frances's name is Frances Halliday, though only "Ha" fits on the mailbox. On the Granger Movie Gauge of 1 to 10, "Frances Ha" is an improbable yet engaging 8, particularly endearing to those who can't quite get their lives together. Back in 1947, Norwegian explorer Thor Hyerdahl decided to cross 4,300 miles of Pacific Ocean on a huge balsa-wood raft called Kon-Tiki, named for the Polynesian sun god. Heyerdahl was determined to prove that, about 1,500 years ago, South Americans crossed the sea and settled in the South Pacific. His book about that perilous expedition has sold more than 50 million copies and has been translated in close to 70 languages. His cinematic chronicle won the Best Documentary Oscar in 1950. Norwegian actor Pal Sverre Hagen plays charismatic Heyerdahl, whose blond/blue-eyed physicality is reminiscent of Peter O'Toole in "Lawrence of Arabia." Financed by the Peruvian government, Heyerdahl and his brave crew of five men -- four Norwegians and a Swede -- spent more than 100 days afloat, encountering whales and sharks, along with treacherous storms, as a radio operator did his best to stay in contact -- when the transmitter worked. While he did bring along a movie camera, Heyerdahl had no motor on board and was resolute about building his raft using only the indigenous materials available to the original sailors, insisting that logs be lashed together with rope, not wire, despite the pleadings of one of his crew. The Norwegian version of this new bio pic was nominated for this year's Best Foreign Language Film, but lost to Michael Haneke's "Amour." Now, an English-language version is playing in local theaters. Directors Joachim Ronning and Espen Sandberg filmed in both languages simultaneously to appeal to the international market, using a script written by Petter Skavlan. Each scene was shot first in Norwegian, then in English. Many years ago, when Hollywood first introduced sound, multiple language versions were more common than they are today. By the mid-1930s, however, dubbing and subtitles took over. In recent years, the most commercially viable dual-language film was Angelina Jolie's Serbo-Croatian/English "In the Land of Blood in Honey," set in Sarajevo during the Bosian War of the 1990s. On the Granger Movie Gauge of 1 to 10, "Kon-Tiki" is an adventurous 8. Astonishing!